With its latest campaign, Etnia Barcelona consolidates its "Anartist" attitude (Anarchist and artist at the same time) that leads them to extend their gaze further and understand their discipline as an art. This concept is very much in line with the Sonar brand, the Barcelona International Advanced Music Festival, which celebrates its 25th anniversary in 2018. Both brands are trendsetters and vanguards in their fields, and thus seek to strengthen this with their association. They also share an audience with similar values. For this reason, the most transgressive brand of glasses, creates Souvenir, a futuristic capsule tailor-made for the event. They have designed a pair of acetate glasses with tinted glass and, attention, with a visor. In order to encourage collaboration and promote the sale of the exclusive glasses, the campaign will be started a couple of weeks before the event. 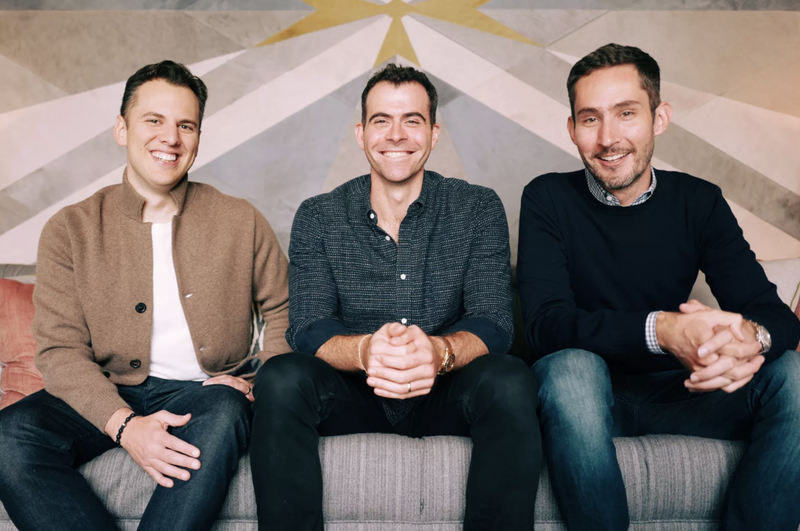 The social platforms chosen are Facebook, Instagram and, for the first time for the brand, Snapchat. On the 3 platforms, the campaigns are divided between the objectives of branding and performance. The target of each is properly segmented and different graphic materials are used throughout each phase to keep the user’s attention permanently. 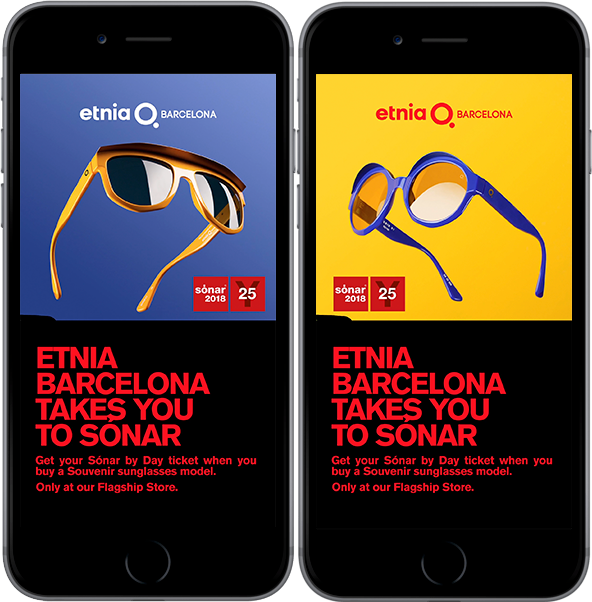 For the first time, Etnia Barcelona will try to surprise Snapchat users with several ads in different placements on the platform. Select the audience you want to impact and choose the Snap ads and geo-filter formats. Before the musical event, the first Geofilter is activated: a template created exclusively by the brand and for the campaign. It is such an exclusive format that its scope is limited to the surroundings of Etnia Barcelona’s flagship store, in the centre of Barcelona. 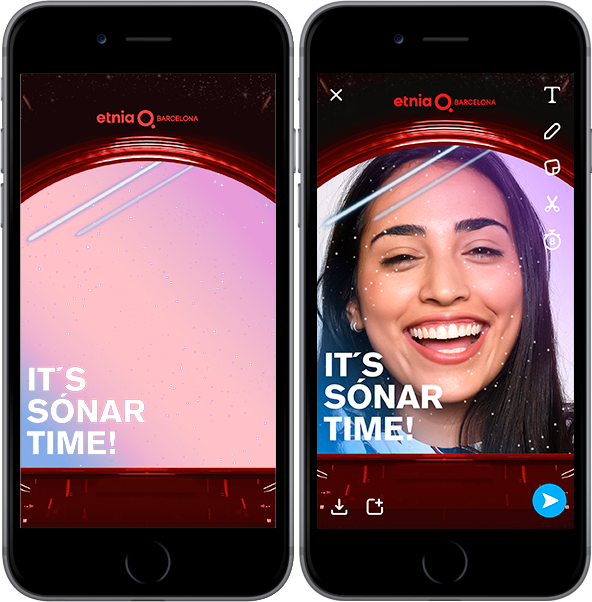 At the same time, the Snap Ads signal the countdown to Sonar and encourage the use of a new filter that will be active only on festival days. During the weekend of the musical event, the last filter is activated. The location which now surrounds the Sonar enclosure is changed and only appears if you are there. It's Sonar Time! If you want us to propose the strategy that best suits your objectives, share your brief with us here.